A deposit of £50 low season and £100 high season which is not refundable payable on booking balance due 4 weeks prior to stay. Also a £50 bond is required to cover any damages refundable after inspection of caravan at the end of your stay. DURING THE SUMMER HOLIDAYS BOOKINGS SATURDAY-SATURDAY ONLY. Please can you state how many beds you will require for the bedding. Parkdean Trecco Bay Porthcawl is situated, next to the blue flag beaches with beautiful scenery and coastal walks. The town is 15 minute walk where there are plenty of pubs restaurants and an amusement park. 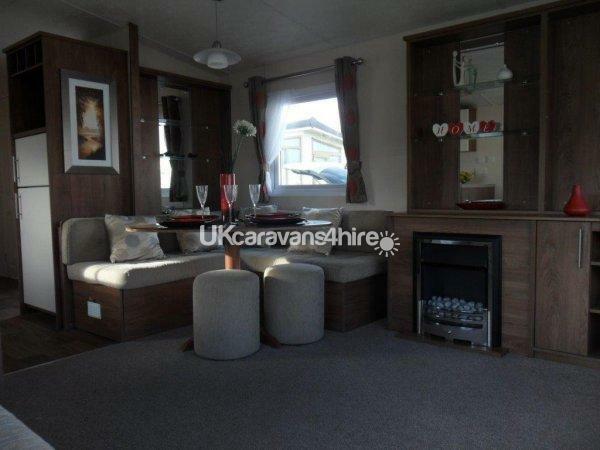 Our immaculate 2015 caravan is located in sycamore which is a quiet cul-de-sac only 5mins from the all the entertainment, pub, and restaurant. 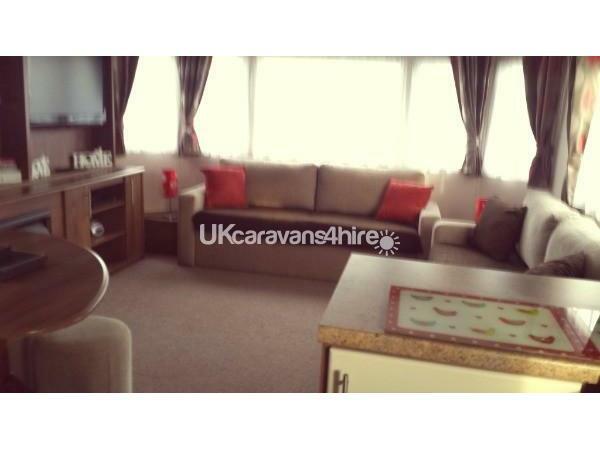 The caravan is a Delta Phoenix 2015 it is 36ft long 12ft wide with double glazing and central heating thou out. 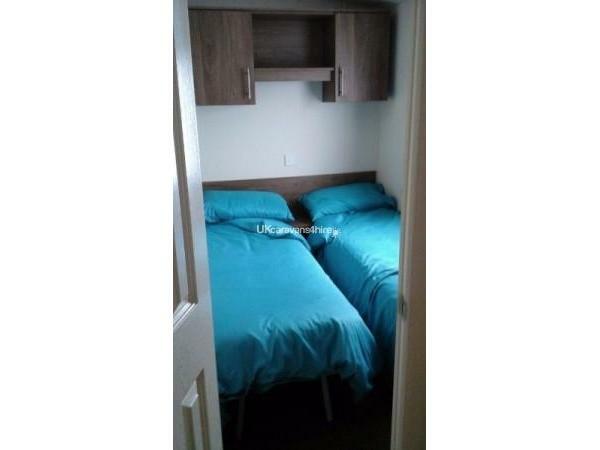 It has 1 double bedroom 2 twin rooms and a bed in the living room. 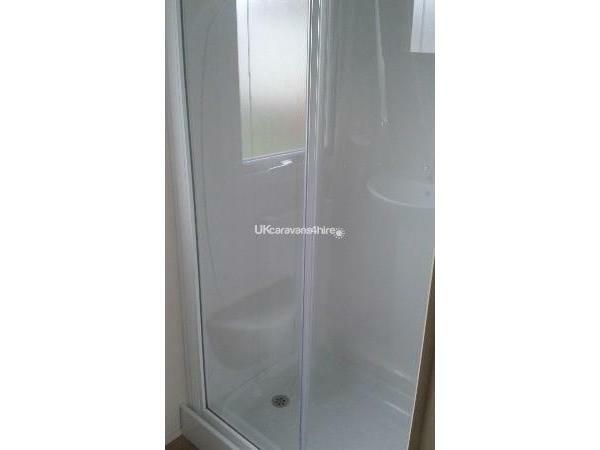 Shower room with hand basin and a separate wc with hand basin. 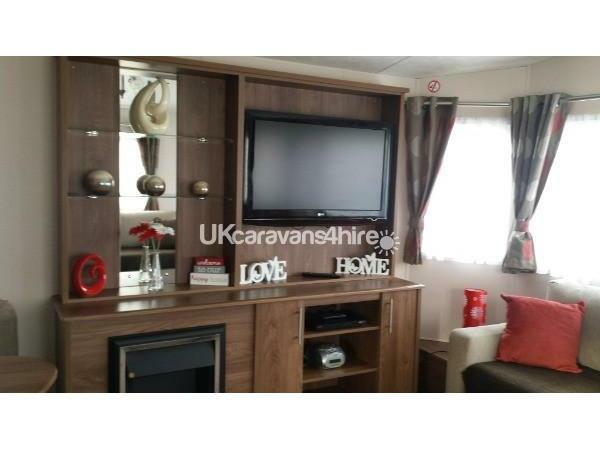 Living room comprises of 40" tv , dvd player, cd player and an electric fire. There is a fully equipped kitchen including oven microwave fridge and freezer. it has separate dinning area. Bedding is supplied. Towels not provided. There is a welcome pack of tea coffee suger & milk. Drinks for children. Passes for the showdome adults bar and the pool can be purchased at reception. Additional Info: Childrens splash area, Football pitch, Bowling alley, Dodgems. Jungle Jims, Park. Thanks for the feed back Sonia. Hope to c u all soon. Phillip and Dawn presented a wonderful caravan for our stay at Trecco Bay. The welcome pack was outstanding covering all the basics with some lovely little extra touches that really emphasises that they are both Pros when it comes to hosting. The booking and check in/ check out process was flawless, Dawn was especially flexible allowing us to start our holiday exactly how and when we wanted. Couldn’t recommend a stay at 157 Sycamore any more highly. We will definitely be returning! Thanks Lucie. See you all very soon. The caravan was spotless and beautifully presented as per usual. A welcome pack was left which was is perfect after a long drive and your dying for a cup or tea! I spent the week relaxing away from all the daily stresses, and luckily the weather was mostly on my side :D I had a wonderful week and will definitely be returning soon. Thank you very much for the stress free holiday! Thanks Laura. Hopefully c u soon? Just got home from a fabulous weekend at Dawns caravan! Absolutely immaculate! It had all the essentials there for you - Teabags, coffee, all bedding including sheets and beds done on arrival!! (Very impressed with that)Toilet roll, tea towels,hairdryer, dvds, Bluetooth speakers, hand wash and lots more! And Dawn very kindly had milk, biscuits and fruit shoots for the children there ready for us! Cannot recommend this caravan enough, brilliant spot on park close to all amenities and fantastic communication, Dawn Couldn’t have made us feel any more welcome! Was there to greet us and to see us before we left! Will definatly be staying in this caravan again! Superb!!! Really enjoyed our stay at this caravan. 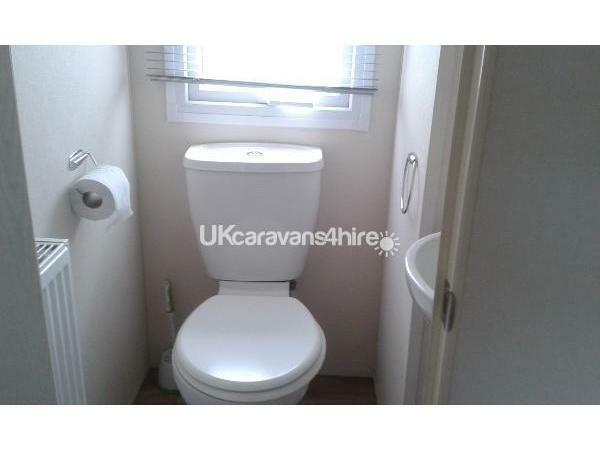 The caravan is very clean, comfotable and essentials such as toilet paper, tissues, salt, vinegar.................................... were kindly provided. The caravan is located close to the main square entertainment. We would hope to book again if returning to Porthcawl. Thanks Gareth. Hope to See you soon. ? The caravan was spotless and beautifully presented. Dawn left a welcome pack which was a lovely touch - especially after a long drive. The directions to get there were clear and the facilities were simple and easy to use. It's a short walk to the beach and other amusements within the park. Communication through the booking/stay was excellent and answered all queries. We had a wonderful week and are already planning to return next year, maybe even a couple of times work permitting! Thank you very much for the wonderful relaxing holiday! Aahh thanks Laura. See you next yr. Thanks guys . Lovely to meat you all. Hopefully see you next yr. Absolutely stunning caravan, we were greeted by the owner and made us feel at home home with tea,coffee,sugar and plus drinks for the children. We as a family enjoyed every minute of our stay and will definitely be booking again. I can not fault this caravan at all modern very clean and comfortable has everything you need for your holiday just like home from home with essentials like a rotary washing line iron and ironing board Hoover and what everybody needs when they arrive a welcome pack of tea coffee sugar ect even a drink for the kids. The van has a parking space at the side of it. It's only a few minutes walk from all the facilities and the pathway to the beach, the bins are about 5 caravans down at the bottom of the little road that the vans on. We had a little problem getting our passes when we arrived but this was due to the site. Dawn was on holiday herself but called the site and sorted it she contacted me back within 15mins to let me know that the passes were ready for collection. She had also given me contact detail of a family member in case we had any problems but they wasn't needed. As for the site the pool was great entertainment for kids was fantastic. As i have a 6yr old i never used the adults only bar or the restaurant but did hear others giving it a good report. If you are taking children they will not be disappointed at all with all the facilities on offer to them in and outdoor play areas an outdoor wet play area,crazy golf,bowling, pool, arcades and bikes you can hire. Whilst we were there they had Joe Pasquale on one night for entertainment each week they have a professional famous entertainer. Area wise you are right on the beach that has a from a pound cafe with nice food. A short walk down to Porthcrawl town centre for the shops, on the way you pass little gift shops stalls that sell burgers ice creams ect and a fair that has rides for kids and adults twice a week the fair is £1 per ride. As an overall review i would highly recommend going to Trecco Bay and hiring this van. I've previously used a Trecco van but Dawn's is far better. Hi Denise. Thanks for the review. Im so glad you all enjoyed. And I really hope to see you all again soon. This was our first stay in porthcawl We enjoyed fantastic weather, and a brilliant caravan in every way . 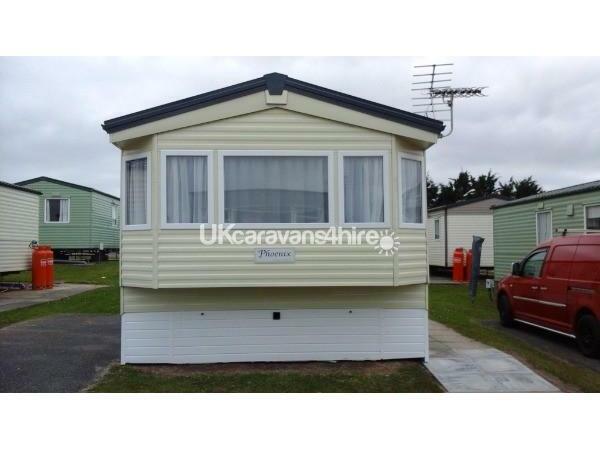 Dawn the owner was very helpful and made our holiday very easy and enjoyable I would book this caravan again I cannot fault it, try it you won't be disappointed. Thanks Debbie from mike and heather Somerset. Thanks both it was lovely to meet both. I'm so glad you enjoyed. Hope to see you soon. ? Thanks for your feedback Diane. Hope to c u again soon. Really nice modern caravan. 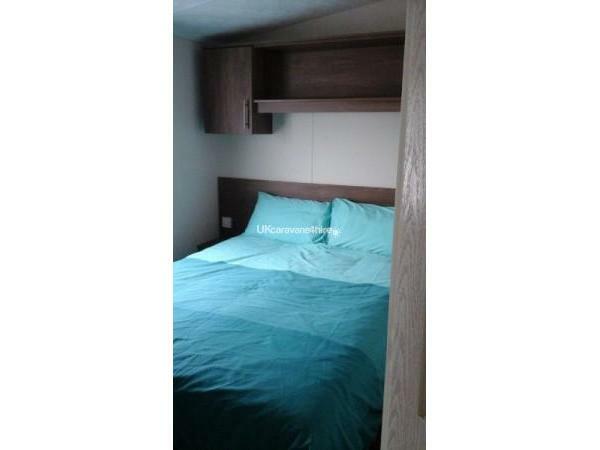 3 bedrooms - cosy and comfortable beds. Loads of storage space - wardrobes and overhead cupboards. Living area was really cosy with lots of room to lounge about. There is a big screen tv and a great selection of kid's DVDs. 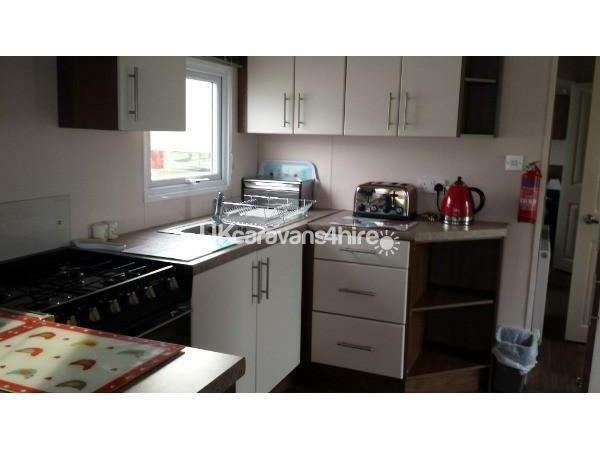 Kitchen is a good size, with a roomy fridge freezer, microwave, toaster, kettle, and big oven. The oven and gas hob were great to cook with, and had meals ready in no time at all. Decent size washroom with great shower cubicle - the shower had a really powerful jet. Hot water and heating (great for drying towels) was instantaneous due to the combi-boiler. 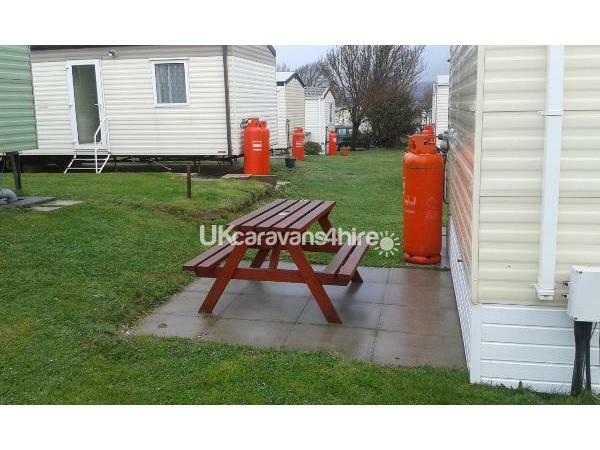 Some really useful extras include a picnic bench, rotary clothes line, vacuum cleaner, sofa bed. All we had to bring was towels and food, as everything else was provided. Had a fantastic time. Felt very comfortable and relaxed. The kids absolutely loved it. The "welcome pack" that everyone goes on about was a really nice touch - it's so nice to be able to walk straight into the caravan and have everything available to make a good ole cuppa tea! (And fruit-shoots for the kids too - so thoughtful!) Dawn is easily approachable and very helpful and made us feel extremely welcome. We will definitely try to book again for next year. Highly recommended. Thanks so much Dawn. Thanks James it was a pleasure meeting u all and Im so glad you all enjoyed. Hope to c u all again soon. Thamk Chris and Wendy. Lovely meeting you and your little family. Hope to see you again. Dawn. Booking went exceptionally smooth with Dawn, she provided us with easy no fuss directions and a cheerful welcome, she went over everything about the caravan and it's facilities and functions. The caravan was easily the nicest one I have been in and had everything you needed. Their was also a welcome pack which we weren't expecting which was fab eg tea, coffee, milk, toilet rolls,washing liquid,bin bags,salt and vinegar also bedding,hair dryer, iron etc. We were only 5 mins walk in any direction to the beach, the funfair and the parks entertainment area. Our family of 4 had an absolute blast here and would definitely stay here again. Hi Eddie. Thanks for review. It was pleasure to meet you andlovely family. Hopefully we will see you next year. Dawn. Thanks Lisa. It was a pleasure meeting you all, and glad the girls had a good time.See you again soon.